Designed to be the easiest and cheapest noise limiting device to install, saving up to £250 on the installation cost of comparable products. More features than the NLX v1 and any other noise limiter at this price. The mains control unit is housed in a separate case which can be fitted at a convenient location out of sight. The high intensity display unit with built-in microphone is connected using low voltage cable for ease of installation. Simple to fit and operate, the NLX (v2.2) noise limiter incorporates the latest features and is local authority approved. With fully automatic operation, full heavy duty 32 Amp switching capability and built in fire alarm interface / door / windows contact connections, this noise limiting device offers straightforward installation and adjustment at a low price. The sound level in the venue is monitored by the microphone and is indicated on the high intensity LED display unit. If the noise remains too loud for a period of approximately 10 seconds mains power is disconnected from the sound equipment for 10 seconds and then automatically reconnected; thus no user intervention is required for operation. The time delay ensures that events are not disrupted unnecessarily. The trigger level is adjustable and linear / bass frequency filter options are available. The trigger / reset time period can be altered if required. 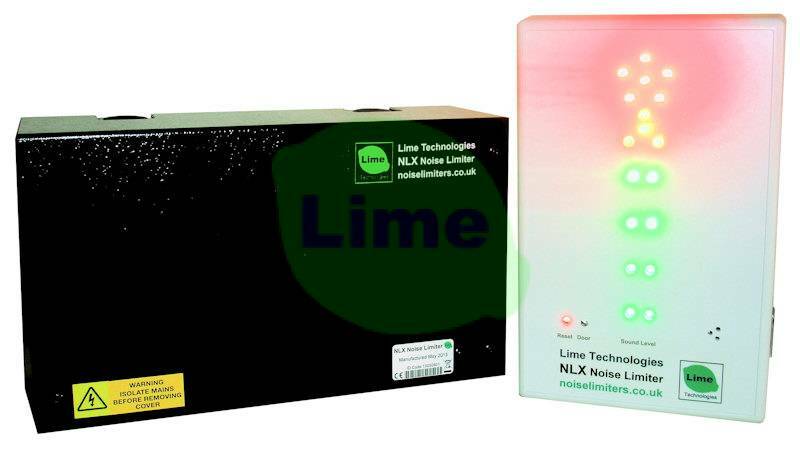 If an additional sound level is required to allow two separate volume levels to be set (so that door / window switches can be connected to reduce the permissible sound level when doors or windows are left open or a timer can automatically change levels for different times of the day / night) our L2X noise limiter would provide the optimal solution. Optional remote indicators are available to provide loud noise warning in other locations (in a managers office for example). • Internal sensitivity (trigger level) adjustment 70 - 120dB approx. The NLX (v2.2) can assist schools in complying with Building Bulletin 93: Acoustic Design in Schools especially Design of rooms for music.